The challenge is to write at least a page a day. Think about what you wish to achieve with this challenge and focus on the project in mind. 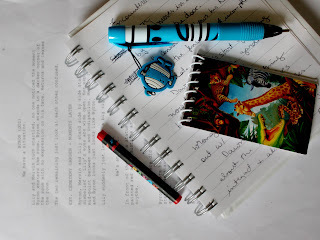 The page a day challenge is to encourage you all (myself included) to write. If you’re already happy with your writing achievements and are a self-motivated go-doer then this challenge isn’t for you; however, if you often struggle to sit still for an hour, always find something else you need to do first, and just generally find excuses to procrastinate, then join in. Any page will do: a Final-Draft page, a Word Doc page, a notebook, an envelope, a napkin. In order to keep writing daily, Jerry Seinfield used to cross out the days on a calendar and the more crosses he had, the more reluctant he was to break the chain. You can download a ‘Don’t Break the Chain’ calendar for free from the Writers Store. From here on you are making a commitment to yourself. In the wise words of Bob the Builder "Can we make it? YES we can!"